My friend Amy is an independent consultant for Thirty-One. Have you heard of it? It's a company that was started by a working mother of two eight years ago. They sell DARLING yet PRACTICAL totes, bags and purses for the modern woman. Whether you're a career woman, mom-on-the-go, a grandma or anything in between, you'll be sure to find Thirty-One's products to be entirely useful and incredibly stylish! 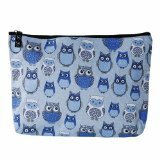 Amy is so graciously auctioning the "I'm a Hoot Owl" all-in-one organizer and zipper pouch! Check out this whimsically cute print. I adore owls! The all-in-one organizer is made of durable laminated nylon and features two exterior mesh side pockets and strong webbed handles. It's also collapsible for easy storage! The zipper pouch is handy for holding make-up, snacks, change, baby goods, er, feminine products ... whatever you want! The winner of this auction will receive the "I'm A Hoot Owl" all-in-one tote and the zipper pouch via postal delivery, courtesy of the donor. THIS PACKAGE IS VALUED AT $32.00. BIDDING WILL START AT $12.00 AND WILL INCREASE BY A MINIMUM BID OF $1 PER BID. If you're interested in more of Thirty-One's products, then today's your day! Amy's offering 10% off to everyone who orders products by December 10th! So go to her store and see if there's anything that tickles your fancy. Which I'm sure there will be! I just had a 31 party and didn't see this print!! I guess it was meant for me to find it here and help out a great cause! !